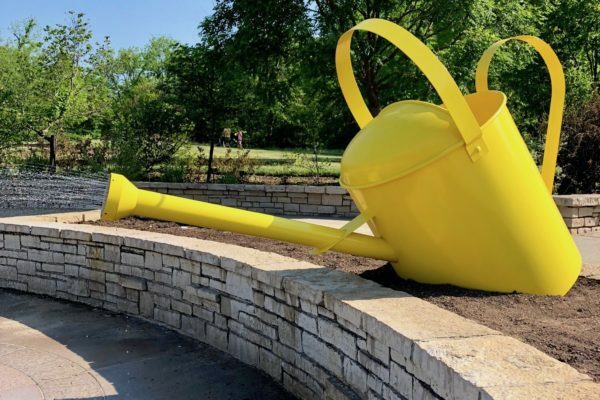 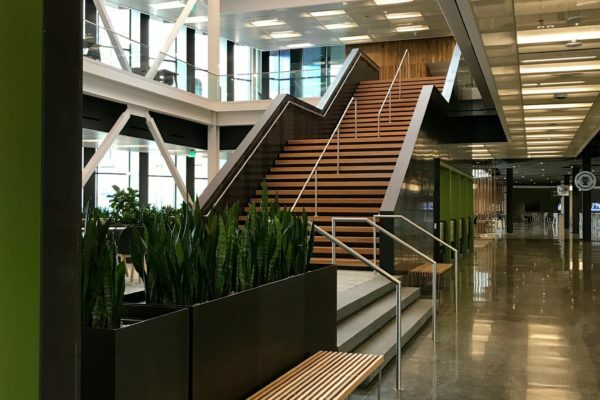 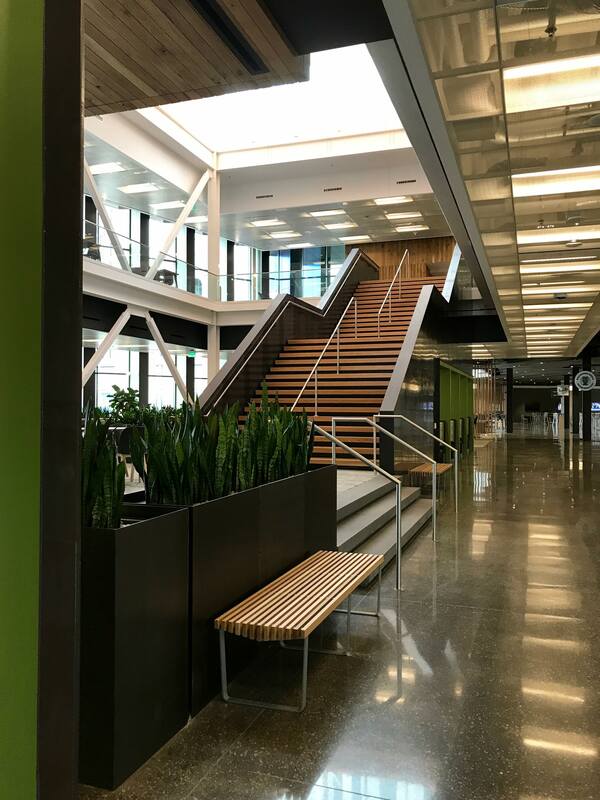 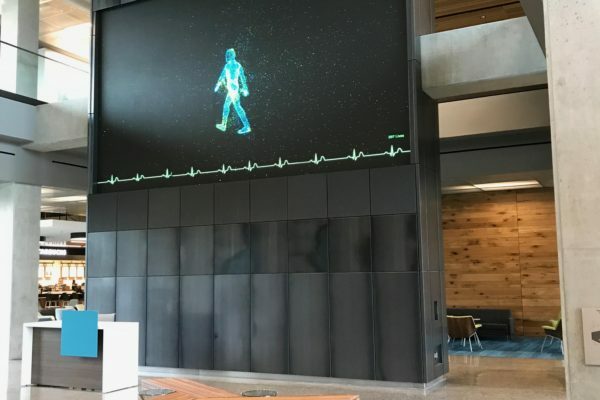 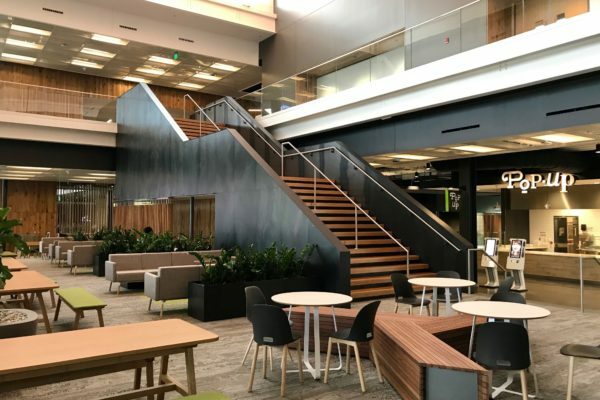 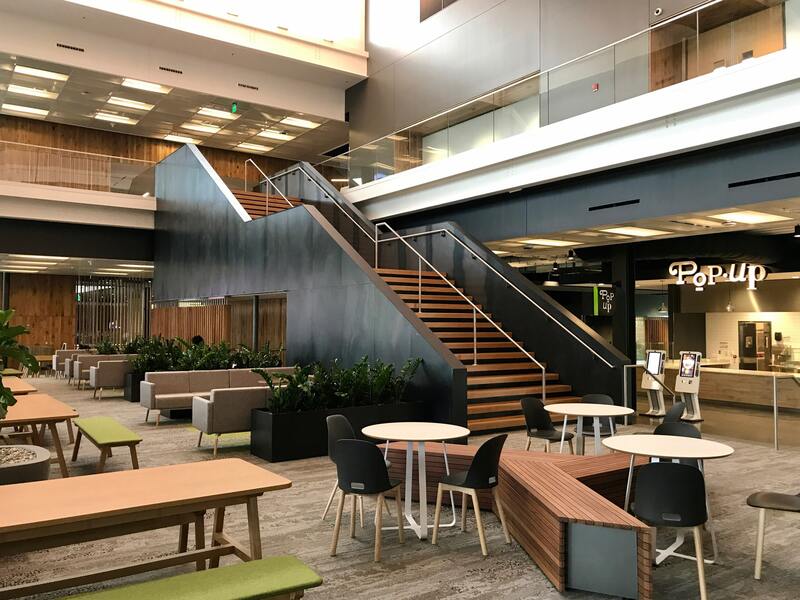 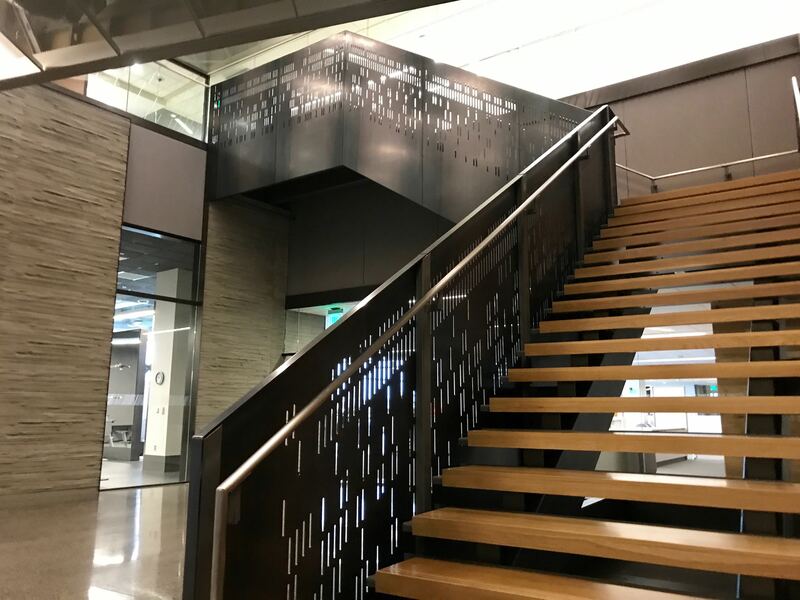 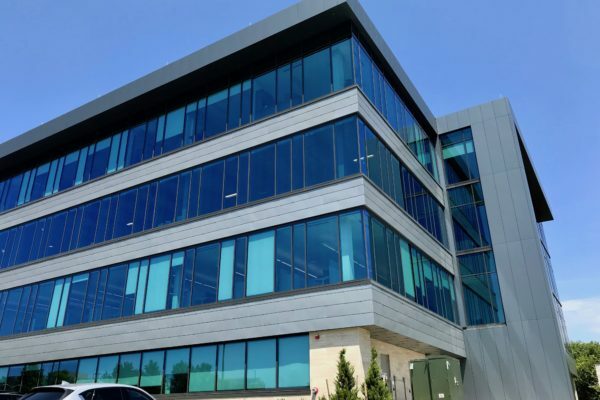 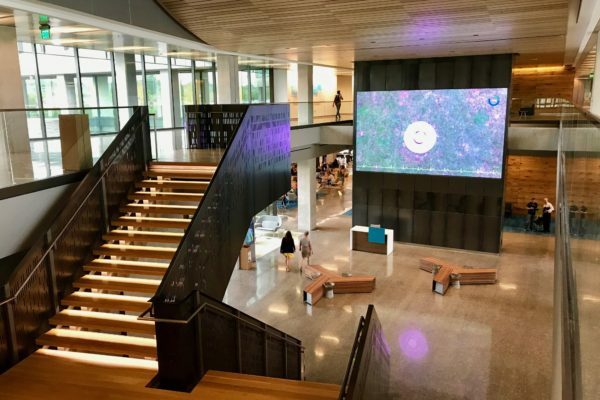 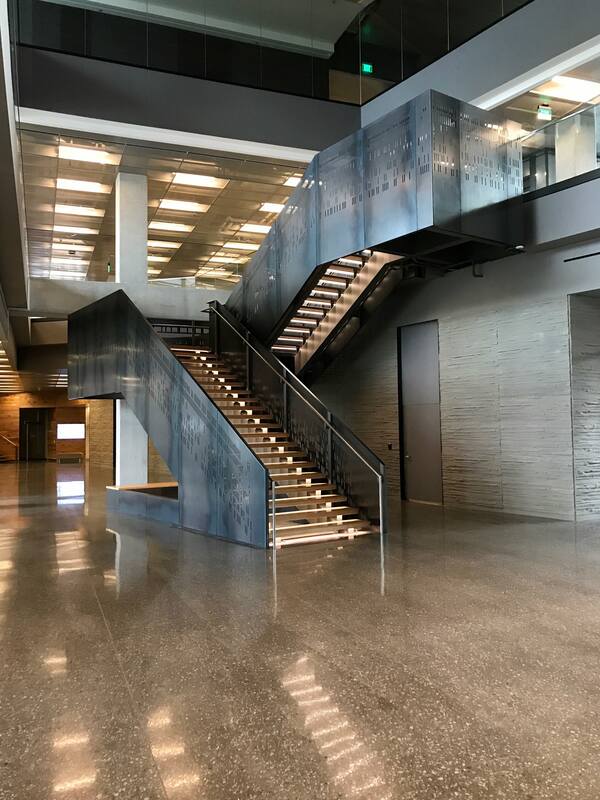 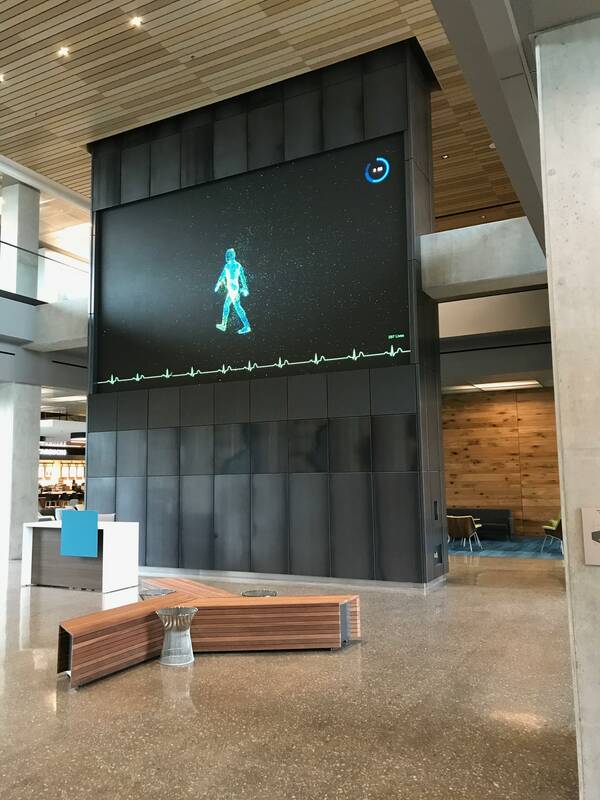 Having been brought in to be a part of the design team, SSM went about the task of assisting in developing the details for the various feature elements at Cerner‘s new Innovations Campus. 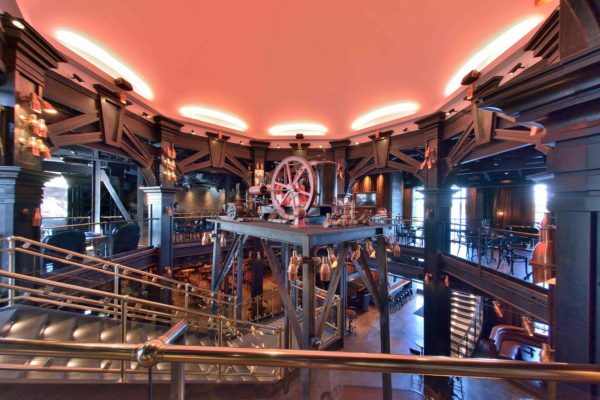 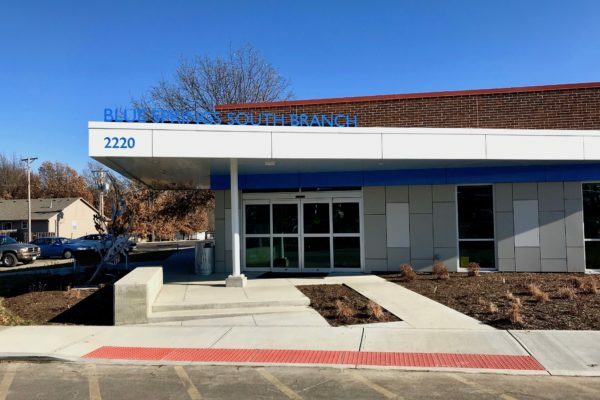 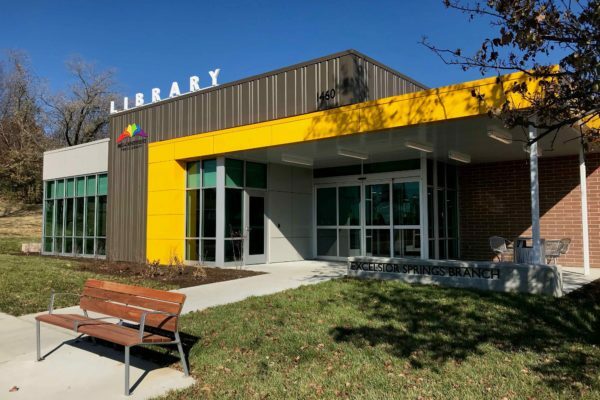 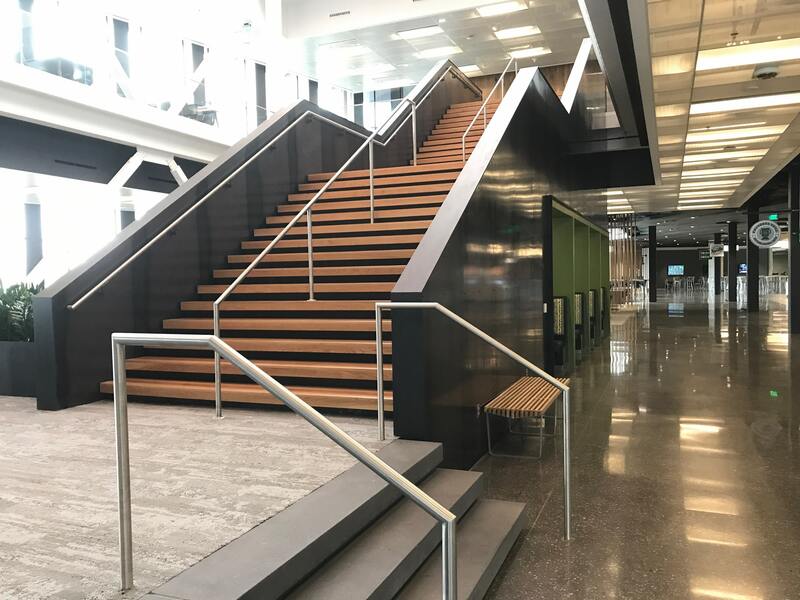 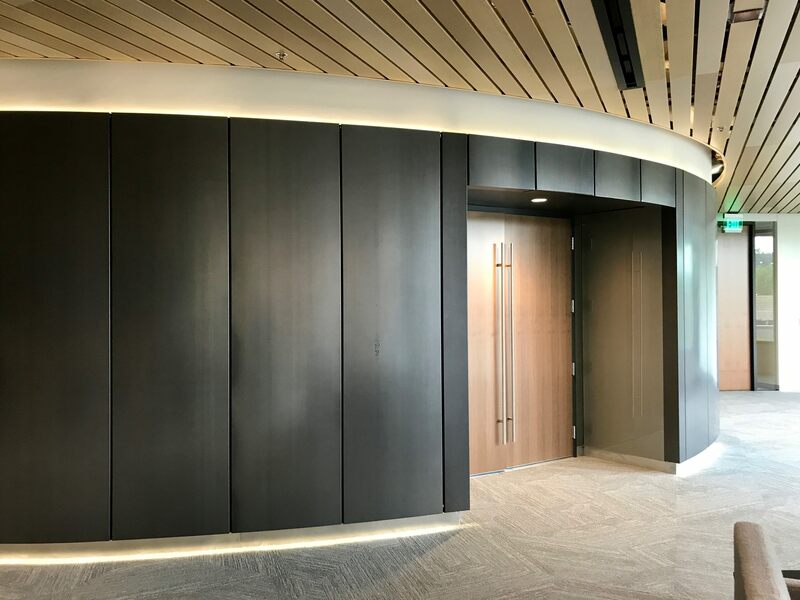 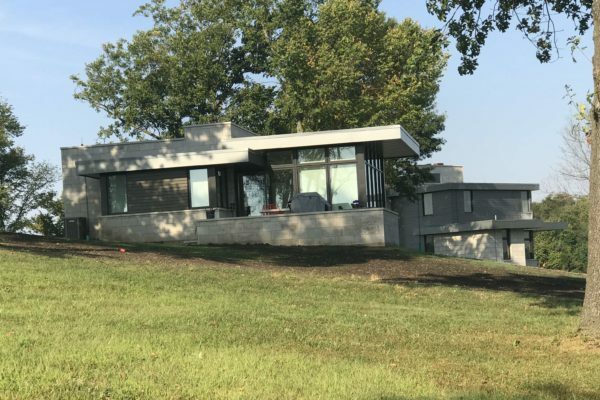 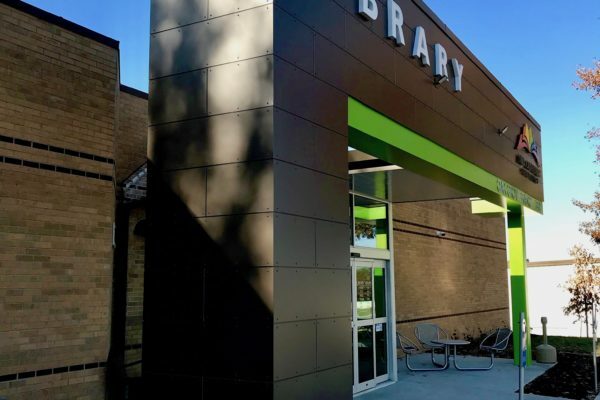 SSM has worked with GouldEvans and JE Dunn previously in a Design / Build capacity and this project presented a new set of challenges that we were excited to take on. 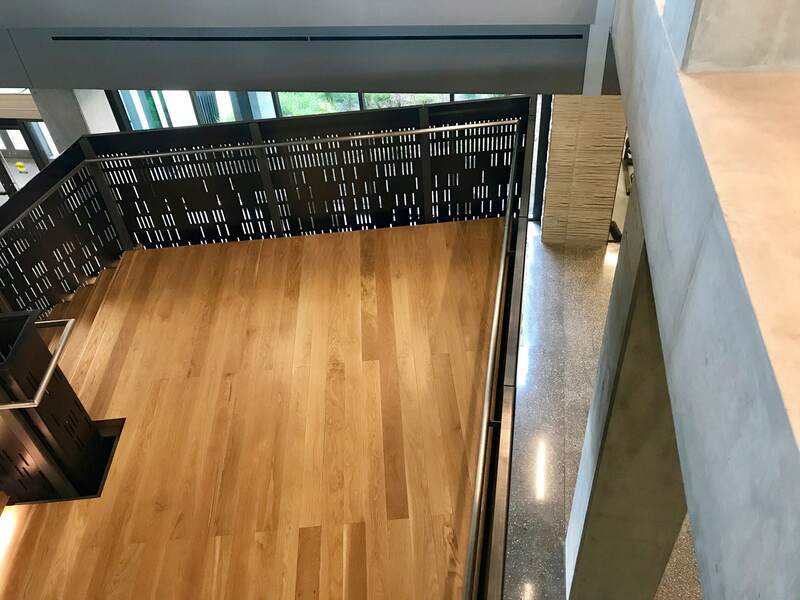 There are three stair cases, located in different areas of the two buildings, that mark major circulation points and features. 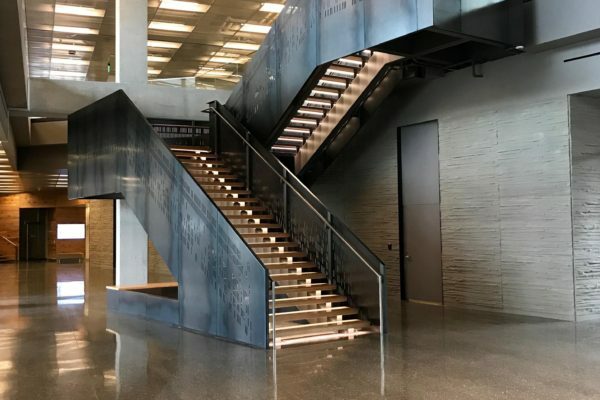 The Grand Stair anchors one end of the main lobby space while, at the other end, the Media Wall defines the other. 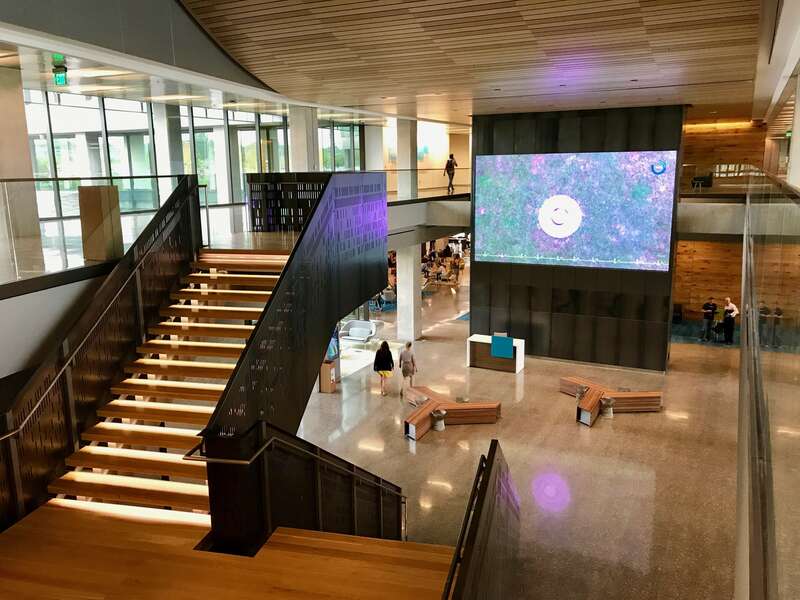 On the second floor, the Experience Conference Center provides a space for customer interaction. 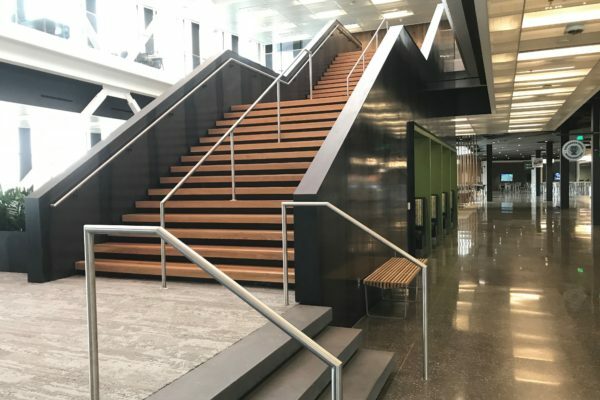 There are an additional two stair cases, that shape their respective areas, at opposite ends of the buildings. 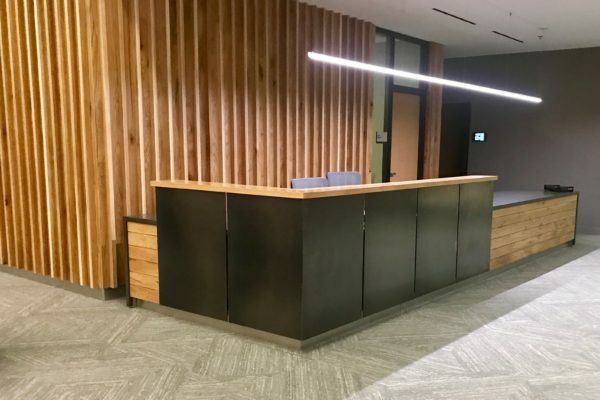 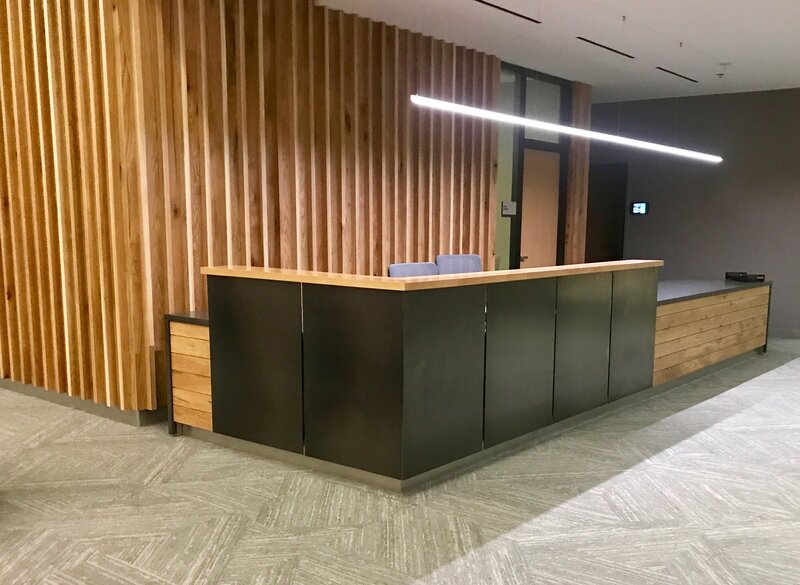 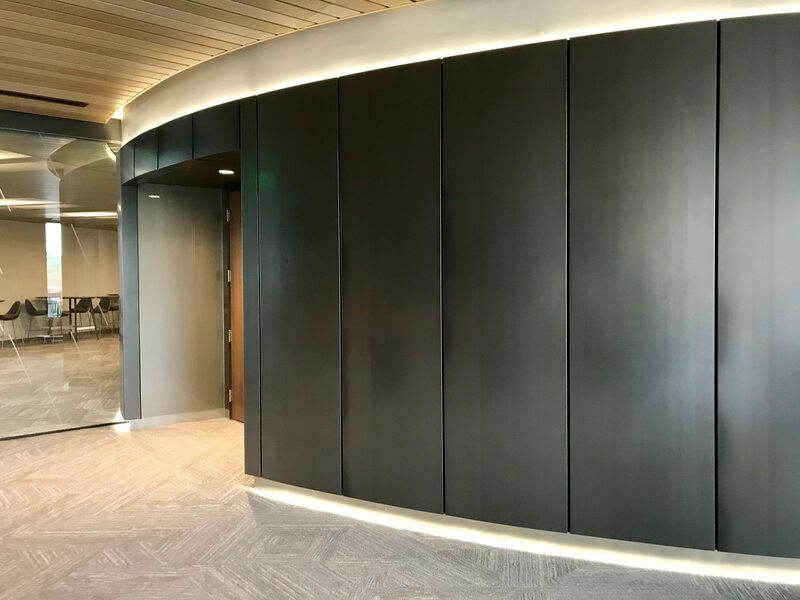 Other items provided include cladding for a reception desk and benches, all featuring the same blackened steel panels. 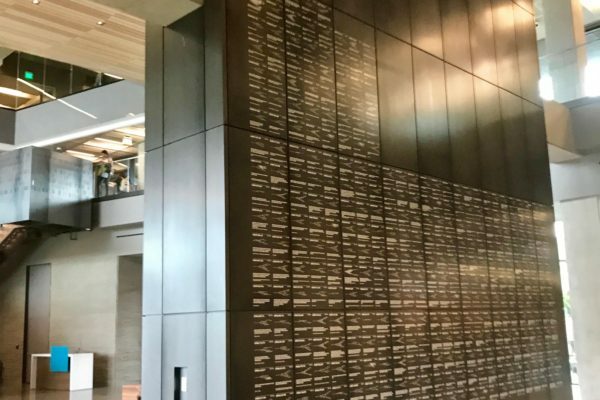 Together, these building elements work as part of the whole, to tell the story of Cerner. 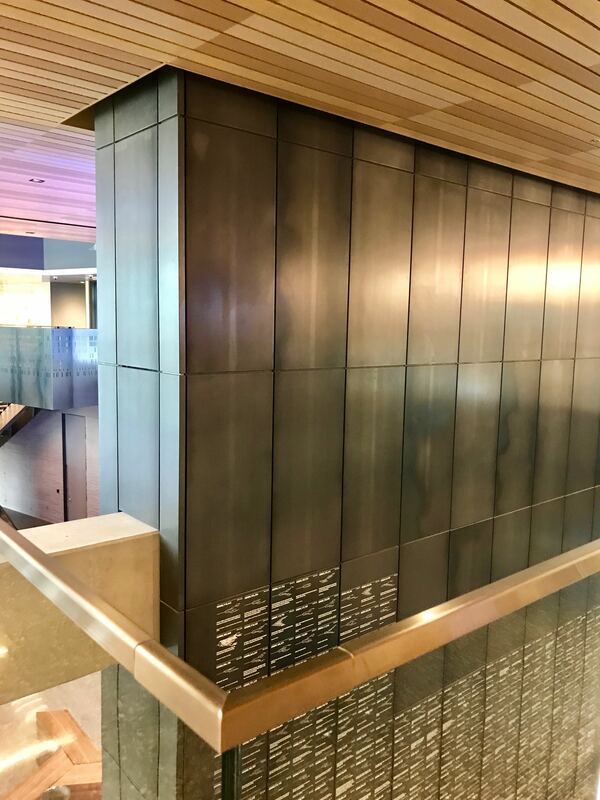 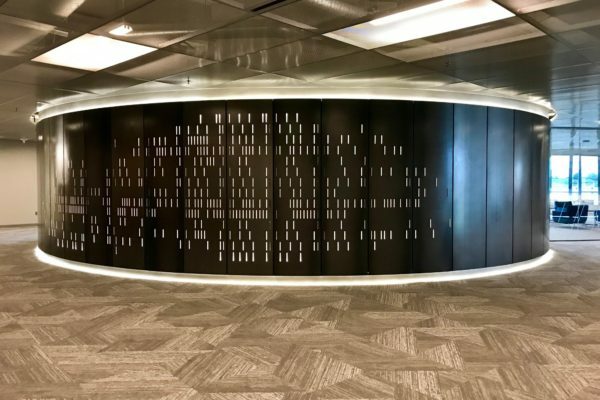 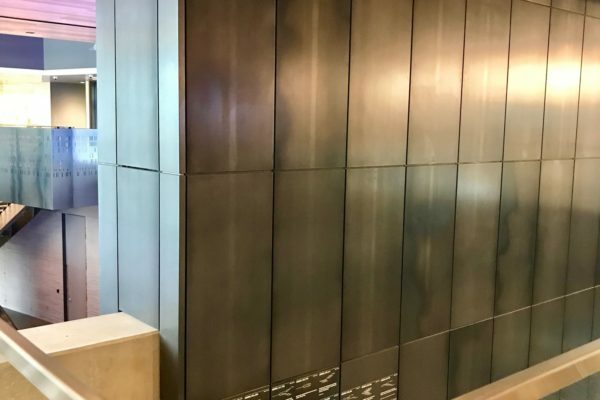 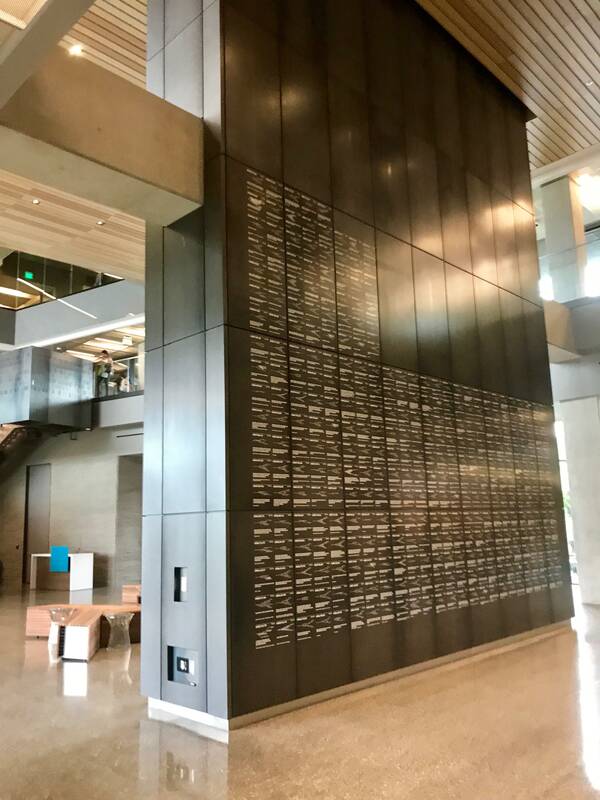 SSM was tasked with developing a blackened steel panel system, for all of the custom metal work, that was perforated with a binary code. 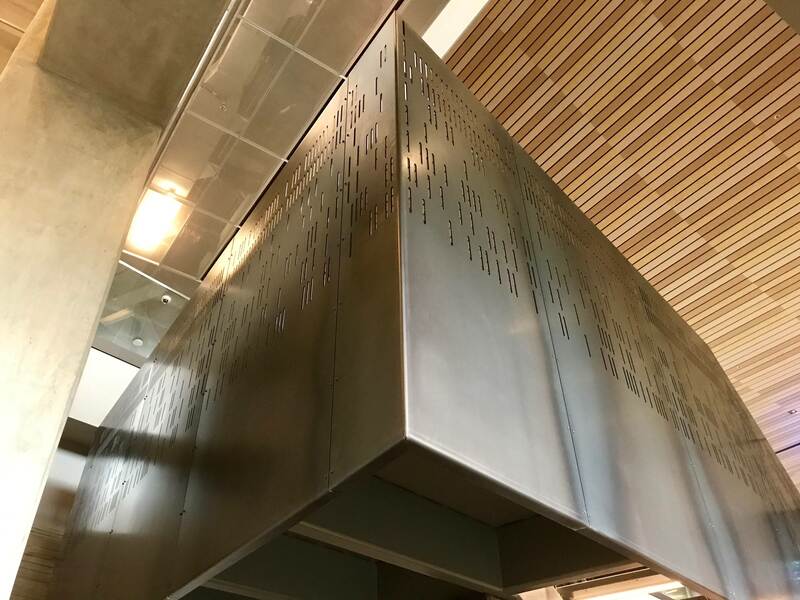 Containing quotes by company founders, the layout of the steel plates was going to be key to the success of the operation. 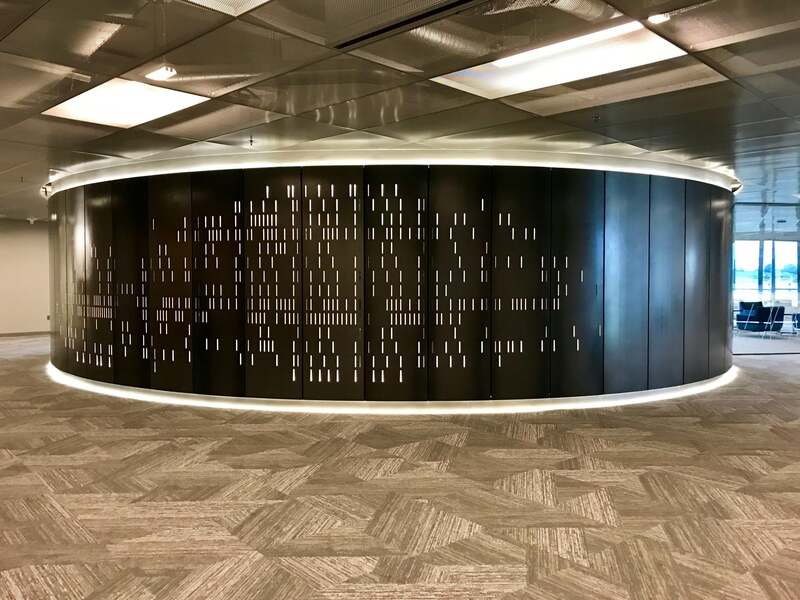 If the messages could not be sharp and easy to read, the project would not work as designed. 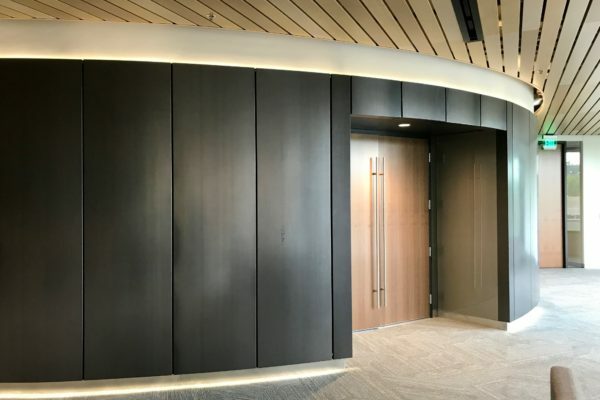 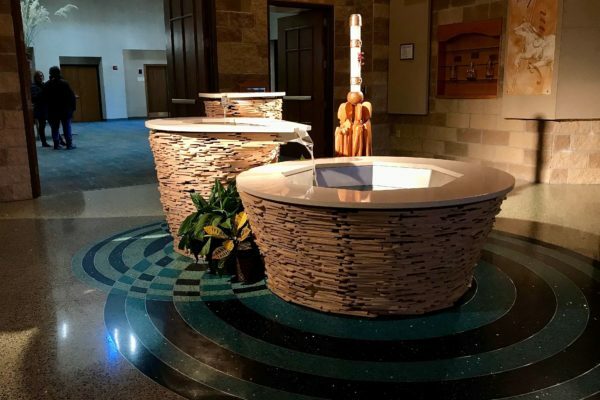 SSM was able to utilize our high speed, fiber optic laser for this component of the work. 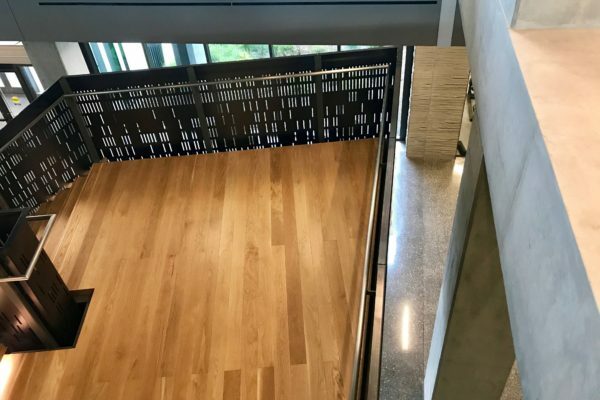 With this piece of equipment, SSM has the ability to take any image or pattern and cut that into any material. 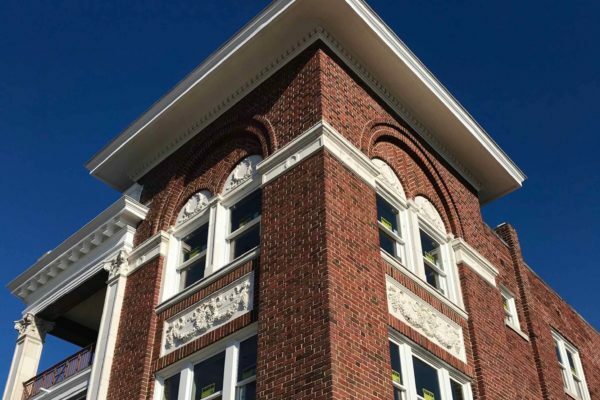 About our processes: Using SSM‘s digital 3D survey equipment, we were able to define all of the building’s components that directly interfaced with our work. 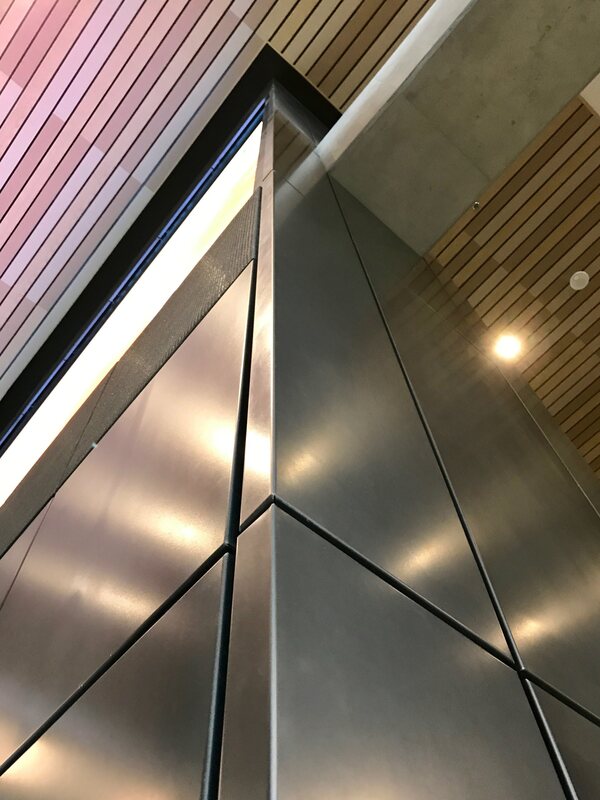 This allowed us to exactly match our fabricated elements to the structural components. 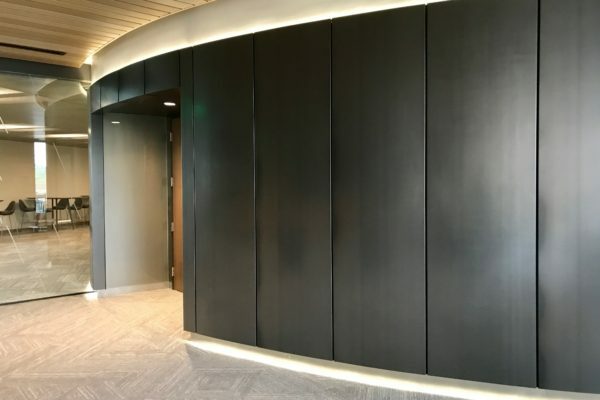 Our cladding system for the Media Wall, is designed so for the ability to allow for panels to be removed. 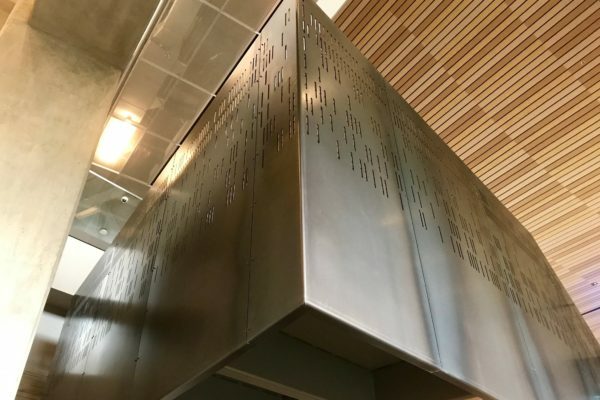 Cerner wanted to be able to post their patents on these panels. 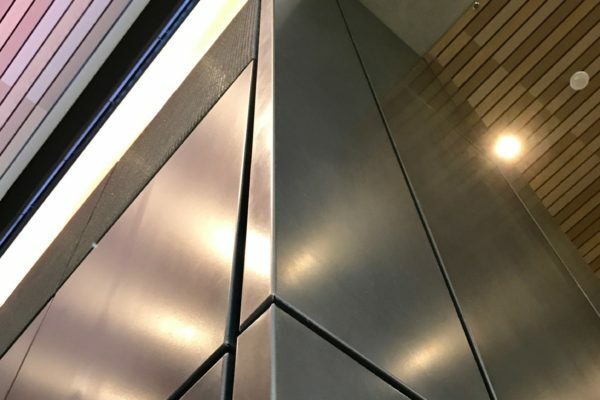 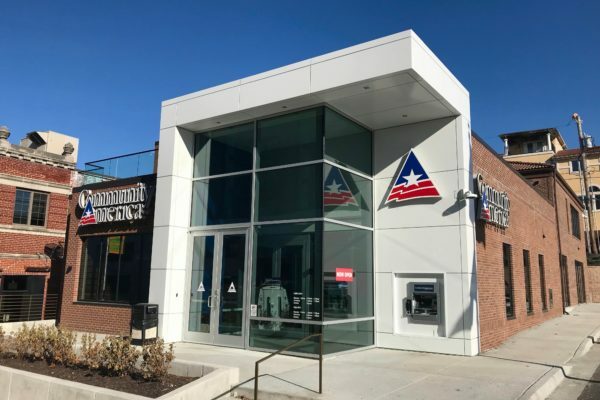 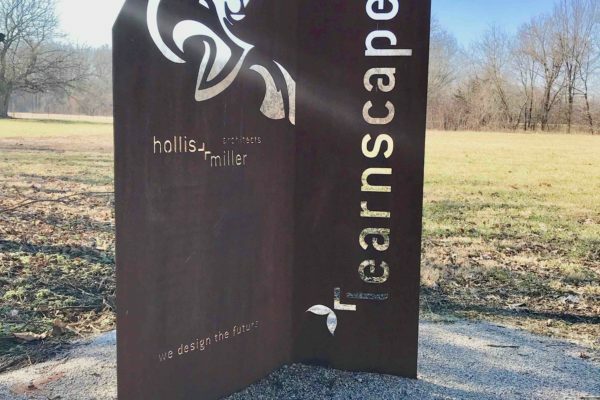 To see what might be the best way to accomplish this, SSM conducted research on various methods of applying text and graphics to the metal surfaces, generating a number of samples to illustrate the appearance. 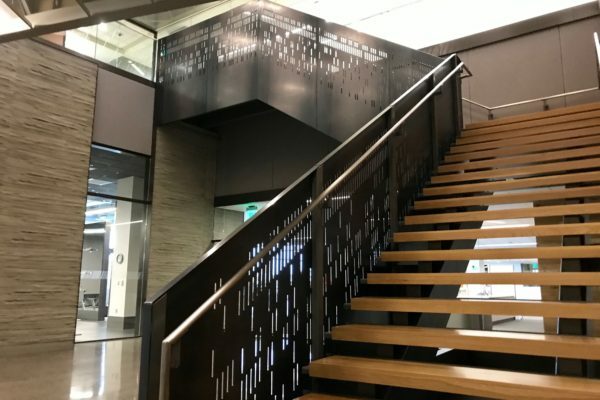 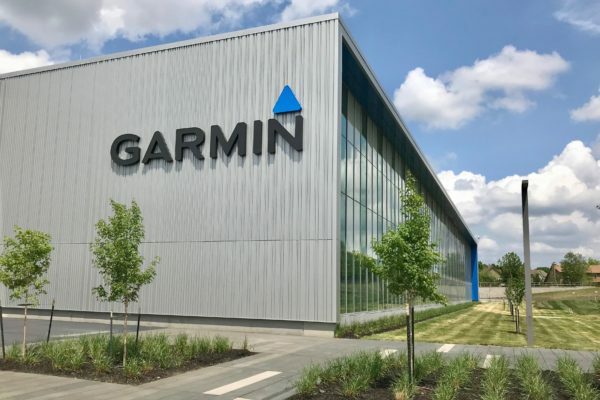 This gave Cerner the ability to see what method looked best and a means to continue adding to their list of nearly 350 patents already identified on the panels.